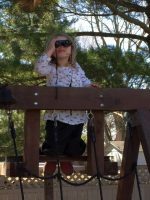 The backyard of Kids N Company Family Childcare fosters a sense of wonder, discovery, imagination, and creativity. One child encourages another to help carve out a creek bed in the Pea Gravel Pit. Another grabs a bucket and heads across the yard to the rain barrel to fill them. 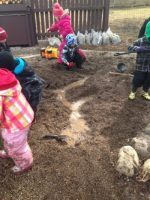 After an hour or so of this harmonious, community work among 2-5-year-olds, the creek is flowing with a continuous supply of water from buckets. STEM (Science, Technology, Engineering, and Math) concepts are implemented in the realms of nature. On another day, a group of children are digging in the Dirt Digging Area. A large hole was mastered that measured up to a 5-year-old’s boot top. A parent arrived and asked the team of three preschoolers, “Are you digging to China?” The children replied, “Yes we are digging to China” The teacher asked, “How many days of digging will it take you to dig to China?” One child says 100 days and another child says 1 million days. 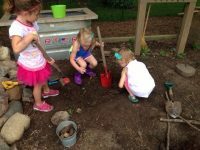 One child was left to dig and think. 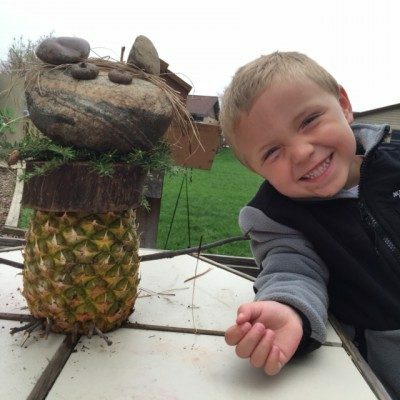 A few minutes later this child asked, “Teacher, if I dug all the way to China would I be standing in the dirt or in the clouds?” This 5-year-old’s critical thinking process evolved from nature immersion. Kids N Company’s curriculum is guided by the children’s interest. 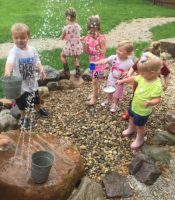 The curriculum is adapted to educational standards while preserving developmentally appropriate practices for each age group served in our family childcare home. Our championing for nature education began after attending a Nature Explore workshop in 2009. The backyard projects continue to enhance the learning experience for our children and our employees. As “free range” kids, our employees experienced childhood with endless hours of unsupervised outdoor play. We are inspired to bring the same experience of awe and wonder we encountered to the children in our care. 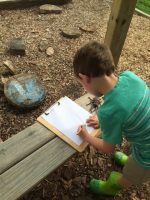 Our goal is to model love and kindness to all living things so our early learners will continue the work of nature preservation.